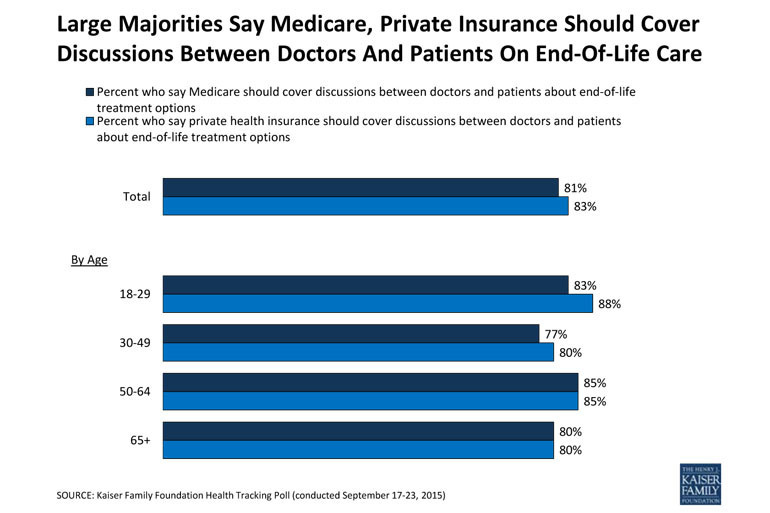 The public overwhelmingly supports Medicare’s plan to pay for end-of-life discussions between doctors and patients, despite GOP objections that such chats would lead to rationed care for the elderly and ill, a poll released Wednesday finds. Eight of 10 people surveyed by the Kaiser Family Foundation supported the government or insurers paying for planning discussions about the type of care patients preferred in the waning days or weeks of their lives. (KHN is an editorially independent program of the foundation.) These discussions can include whether people would want to be kept alive by artificial means even if they had no chance of regaining consciousness or autonomy and whether they would want their organs to be donated. These preferences can be incorporated into advance directives, or living wills, which are used if someone can no longer communicate. The Centers for Medicare & Medicaid Services earlier this year proposed paying doctors to have these talks with patients. A final decision is due out soon. The idea had been included in early drafts of the 2010 federal health care law, but Sarah Palin and others opponents of the law labeled the counseling sessions and other provisions “death panels” motivated by desires to save money, and the provision was deleted from the bill. The notion of helping patients prepare for death has support among many doctors, who sometimes see terminal patients suffer from futile efforts to keep them alive. Last year, the Institute of Medicine issued a report that encouraged end-of-life discussions beginning as early as 16 years old. The Kaiser poll found that these talks remain infrequent. Only 17 percent of those surveyed said they had had such discussions with their doctor or another health care professional, even though 89 percent believe doctors should engage in such counseling. A third of respondents said they had talked to doctors about another family member’s wishes for how they would want to be cared for at their end. While none of these proposals calls for the cost of care to weigh on these discussions, the final years of life are indeed expensive for America’s health care system. The Dartmouth Atlas of Health Care has calculated that a third of Medicare spending goes to the care of people with chronic illnesses in their last two years of life. That is likely to increase as the population of those older than 65 increases. An analysis by the Kaiser foundation found that Medicare spending per person more than doubled from age 70 to 96, where it peaked at $16,145 per beneficiary in 2011. The Kaiser poll found less public support for a cost-containment provision that did make it into the health law. The “Cadillac tax” begins in 2018 and will impose a tax on expensive insurance that employers provide to their workers. Sixty percent oppose the plan, which economists have long favored as a way to discourage lavish coverage and make people aware that extensive use of Medicare services is linked to premiums. The poll also found that 57 percent of people favor repealing the medical device tax, another piece of the health law that Republicans in Congress are trying to repeal. The tax applies of artificial hips, pacemakers and other devices that doctors implant. The poll was conducted from Sept. 17 through Sept. 23 with 1,202 adults. The margin of error was +/- 3 percentage points. Next Post What’s a woman to do?